"Liu Fuming is the perfect example of ordinary people doing extraordinary things. He wins respect and recognition by getting everything done well." This is the praise for Liu Fuming by his colleagues in the Xingyang Management Office of the middle route of the South-to-North Water Diversion Project. Liu Fuming, 38, began working for the South-North Water Diversion Project six years ago. Zhao Yanlei, his colleague and roommate, said of Liu, "He always works with earnestness." They are both in charge of the management of the Xingyang Project of bid section #1, and had come to know each other well. "In the lining, laying and inspection and acceptance of channels, he always took with him a steel measure tape to ensure that every lining of concrete panel met the design standard, which is 10 centimeters. From seven in the morning to nine in the evening, he always kept an eye on the project quality. Besides, he often conducted unannounced inspections at night. However, I have never heard of complaints about difficulties and tiredness from him." When I asked Zhao to say some recent things about him, Zhao paused briefly and said, "In 2017, he was the director of the Electromechanical Dispatching Department, responsible for the rectification work of cable trench. The work of hanging signboards, one of the tasks for the position, is tricky enough, for he had to arrange every cable wire and mark out its type and specification before he could hang the signboard, and there were over 6,000 signboards to be hung. "In addition, the work was not done by just hanging all the signboards. He had to check them one by one in the trench of 20 to 30 kilometers long in case of mistakes. He had to get those items that failed to meet the standards remade or replaced. That time I felt like I had fallen into a bottomless hole. But he responded to the situation with patience. He checked all the items four times until all of them complied with the standards. From then on, I started to admire him." "I used to work at the central control room," said Fan Mengsa of the Comprehensive Division. "We were accustomed to cleaning up the office before shift change. Once, I roughly cleaned it, which I thought was tolerable. But when he came, he picked up the mop and cleaned it again. To my surprise, he even went to the back of the monitoring screen, which had always been ignored, and cleaned the gaps between facilities." All in all, Liu's colleagues attributed his earnestness in his work to a long-established habit and not to an affectation. "I came from Hulunbeir of Inner Mongolia," Liu said. Men from the Hulunbeir Grassland are known to be rough and unrestrained, but Liu is a bit bashful in front of me, with a plain and unpretentious appearance. He said, "I graduated from the Shijiazhuang Institute of Economics with adegreeinprospecting technology and engineering. I came to work for the South-North Water Diversion Project because I wanted to learn a few things. I didn't want to do design work because it is relatively monotonous and has little connection with others." The construction and operation management of the South-to-North Water Diversion Project involved various fields, and entailedmanagers to deal with people from all walks of life. Liu said that he could do better if he went back to do design work after his experience in the project. In the eyes of Nan Guoxi, deputy director of the Office of Management, Liu had learned more than just a few things over the years. 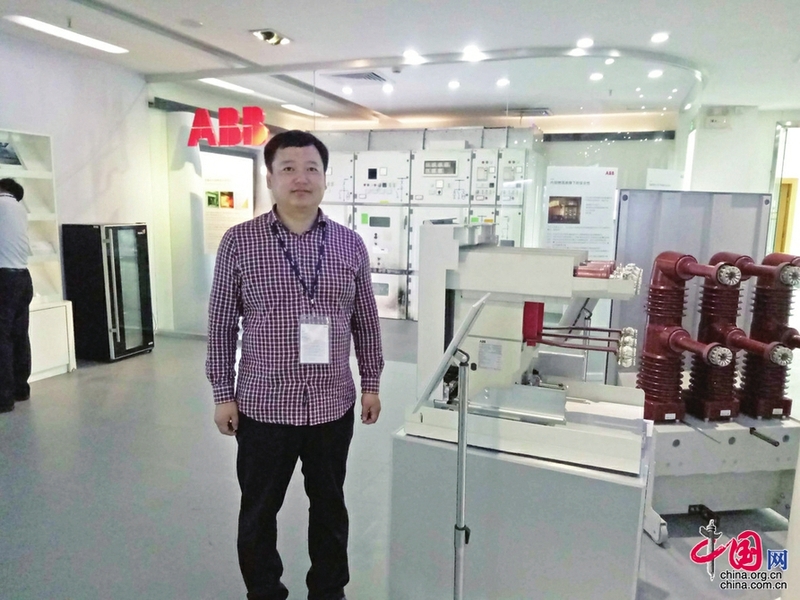 In 2017, the "Modification Project of Temperature Control Instrument for ABB High Voltage Cabinet" by Liuwon first price in the competition of scientific and technological innovations held by the Henan Branch of the Construction and Administration Bureau of the South-to-North Water Diversion Central Route Project. When the project first began operation, the entrusted mechanical and electrical maintenance unit used to replace the temperature control instrument panel that failed. Liu was surprised to see the price of a temperature control instrument panel, which was 2,000 yuan. There were dozens of such instrument panels at a management office, adding up to nearly 1,000 panels along the route. On that occasion, he said, "The point is that we don't know the principles of these instruments, otherwise, we don’t have to suffer such a loss." Then he was determined to find the causes of the failures and the way to fix them. But thiswasnot easy for a person without the relevant educational background. During that period of time, Liu plunged himself into this undertaking and even reviewed the electrical principles in high school textbooks. However, theories weredifferent from practice, so he started to consult with others. There were several experienced mechanics in the installation unit of gate and hoist, so wheneverLiuhad free time, he would communicate with those mechanics. When maintenance personnel came, he would always seized the opportunity to study from them. When the branch office organized qualifying training, he always learned actively and practiced until he completely grasped it. "The understanding of electrical principles does not mean that I am fully qualified. Compared to those electrical engineers, my knowledge is not worth mentioning," Liu said modestly. "Now I can handle common failures, which I dared not to think about before." With such perseverance and careful diagnosis, he found that the failure was often due to a probe inside the instrument, and the repairs of this probe only costed about 10 yuan. With this method, he succeeded in repairing five instrument panels that failed in thetwo years working at the Xingyang Management Office. "Never chase a horse, but grow grass. When the spring comes, a herd of horses will come for your choice," Liu said, in talking about the importance of enriching himself. Ji Rongxian, Liu's colleague, told us that Liu often helps others. "Liu is the best at adapting to the transition from project construction to operation management," Ji said. "I came to the management office later than he did. The management of project archives involved plenty of things, thus it was not easy to collect all the materials. Whenever I had troubles and doubts, I would ask Liu, and he never held back his knowledge. When it was necessary to coordinate the construction units, he never declined. He is such a sincere and easy-going person." After Liu took over inspections responsibilities, the office became able to anticipate the focus of the inspections. He said he saw a pattern, "If as expected, the focus of the next inspection will be the grounding of electrical facilities, so we should inspect and rectify beforehand." Hence, the management office would hold a meeting and asked the staff to do their own inspections on fire equipment, grounding safety of electrical equipment, lightning protection facilities, and correct and inadequacies. As a result, the Xinyang office began receiving praises from the inspections. "Self-enriching is not a deliberate deed," Liu said. "You will be rewarded as long as you get everything done well." His words remind me of a line, which tells the best of him: "The best things come when you least expect them to."